As traditional powers such as the United States, France and the United Kingdom struggle through another year of dysfunction, those looking for a better way of doing things would do well to look at some of the world’s smaller countries for inspiration. So suggests this year’s estimation of the world’s best countries. This estimation is based on four popular indices of national performance: the UN’s Human Development Index, the International Institute for Management Development’s World Competitiveness Scoreboard, Vision of Humanity’s Global Peace Index, and Transparency International’s Corruption Perceptions Index. The goal of this exercise is to identify which of the world’s countries could credibly claim to be the world’s best at providing a high standard of living in a safe and peaceful setting, while enjoying the benefits of a robust economy and the trust that others can be counted upon to be fair and honest. Since each index assigns scores differently, I’ve standardized the scores by comparing each country to the best performer in each given index, with the best-performing country having a score of 100. If one assumes the best country to be the one with all four scores closest to 100, then this year’s winner is a bit of a surprise: Austria. This small Alpine country of less than nine million people scored consistently very well, if not perfectly, right across the board, with all four scores being greater than eighty. Similarly strong performers included New Zealand, Iceland and Denmark. Canada finished a strong fifth. If one looks instead at the average score, which favours those countries with the lowest overall deviation from a score of 100 even if there is a shortcoming in one area, then the order changes slightly. By that standard, Denmark can claim to have been the world’s best country in 2018, an honour it wouldn’t be claiming for the first time, but hampered slightly by a slightly weaker Global Peace Index score. New Zealand again claims the number-two spot, followed by… Singapore. Singapore’s strong performance is an interesting case, in that it can at best be called an illiberal democracy: critics of the government can and do find themselves sued for defamation, and even use of the city-state’s Speakers’ Corner is carefully monitored. Yet it scored very well in human development, economic competitiveness and lack of corruption, and on par with Canada in terms of peace and safety. If you’re in the market for a system of government that runs things with a very firm hand, yet delivers results, Singapore sets the standard. But don’t give up on liberal democracy just yet: the rest of the list is full of quite liberal places, with Canada finishing just a bit behind Switzerland and Iceland, and just ahead of Norway and Sweden. The Nordics are still very much on-the-ball when it comes to doing a good job of running a country. The year 2018 was a less happy one for traditional great powers. Based on the first measure further above, the United Kingdom finished 29th, France 30th and the United States 37th. The average score method used immediately above delivered happier results, with the U.K. at 16th place, the U.S. 19th, and France 24th. They could all use a little more of whatever it is Austria, Denmark and New Zealand have going for them; as could much of the rest of the world. “Big changes considered for Ontario workplaces,” said one headline on the CBC News Toronto web site this past February, after it had been revealed that, among other things, Ontario’s provincial government was considering raising the minimum annual holiday required by the province’s Employment Standards legislation from two weeks to three. As far as annual holidays goes, however, what was ultimately proposed by Ontario premier Kathleen Wynne’s government at the end of May certainly could not be described as “big”. Even to describe the proposed changes as “modest” could be considered an exaggeration. The Ontario government is indeed proposing to raise minimum annual holidays from two weeks to three weeks. Here’s the catch, however: it only applies to those who have worked for the same employer continuously for at least five years. Anyone with less than five years’ service could still legally be offered only two weeks per year under the proposed change. “We have fallen behind,” Wynne said as the proposed change was revealed. “And we don’t really feel like catching up,” she might as well have added. Even by Canadian standards, Ontario’s “two weeks for the first five years, then three weeks” plan represents an insignificant change. Alberta, B.C., Manitoba and Quebec have all had the same conditions in their employment laws for years, while most other provinces and the federal Labour Code offer a third week after longer periods of service, ranging from three weeks after six years at the federal level to three weeks after 15 years in Newfoundland and Labrador. Ontario and P.E.I. remain the only provinces without a third-week provision. Saskatchewan is the only province to have broken the two-week baseline. Their laws provide for three weeks annual holiday to start, rising to four weeks after 10 years. By international standards, Ontario’s not-so-big change looks even less impressive. In 1970, signatories to the International Labour Organization’s (ILO) Holidays with Pay Convention each pledged to provide for annual holidays that would be “in no case . . . less than three working weeks for one year of service.” Canada, however, was never among the signatories. The list of advanced economies offering less than three weeks (or 15 working days) per year is small, and has been shrinking in recent years. The United States provides no legal minimum. Hong Kong, Singapore and Taiwan each provide for seven days off. Japan and Israel are more or less on par with Canada at 10 to 12 working days. Then, that’s about it, except for a gaggle of smaller or less thoroughly developed economies. Now, compare that to Australia. Australians first won the right to two weeks annual holiday with the Annual Holidays Act in 1945. This was raised to a three-week minimum — still unheard of in Canada outside of Saskatchewan — in 1963. That country further increased the legal minimum to four weeks in 1974. Across the Tasman Sea, New Zealand — a country which dislikes being compared to Australia, but I’ll do it here anyway — was a little more restrained. They won two weeks annual leave in 1944, threw in a third week 30 years later, and finally raised their legal minimum to four weeks per year in 2007. Surely to God a modest boost from two weeks to three weeks annual holiday per year, merely meeting the ILO’s recommended rock-bottom minimum and matching what New Zealanders had from 1974 to 2007, would not make a dent in any province’s economy. It might even provide a very mild stimulus as people used the time to spend money on things that they don’t normally spend money on during the typical work day or weekend. It would be an easy and fairly equitable crowd-pleaser, too. It was a risk that Kathleen Wynne’s nearly 14-year-old (i.e., geriatric, in political terms) Liberal government could have afforded to take. Instead, they reinforced a penurious status quo, only a little bit more generous than Japan’s legendarily limited allowances — although even Japan has slowly started to come around to the idea of taking holidays in the face of a persistent economic and quality-of-life malaise. Meanwhile in Canada, the stinginess on annual holiday provisions goes on and on and on. It has been more than two years since the last time I compared countries across four indices — the Human Development Index, the Corruption Perceptions Index, the World Competitiveness Scoreboard and the Global Peace Index — in search of the world’s best countries. So, I decided that it was time to do so again to see if anyone has moved up, or down, in the world. This is particularly timely given that the White House is currently occupied by a bizarre new president who has vowed to “make America great again”. Just what does “great” look like? To be a contender, by my standards, a great country needs to provide its citizens with an exceptional quality of life, an honest form of government and judicial dispute resolution, economic opportunity, and protection from harm. Thus, it should rank highly across all four of the indices noted above. Last time out, Denmark emerged as the world’s best country, followed closely by Switzerland, New Zealand, Finland and Norway. Canada’s average score of 91.6 was good enough for a seventh-place finish, just behind Sweden. This year, not much has changed. Denmark, Switzerland and New Zealand repeat their first-, second- and third-place finishes, with Sweden and (surprise!) Singapore rounding out the top five — even though Singapore performed relatively weakly in the Global Peace Index. Iceland, Norway and Canada tied for sixth place with a score of 91.5, while Finland and the Netherlands round out the top 10 with another tie at 90.1 each. What if we calculate each country’s standing a bit differently by looking not at the average, but at the weakest link — the point at which the country deviates the most from the perfect score of 100? In this case, Denmark still remains number-one, with a score of 93.6, followed by New Zealand and Switzerland. Canada, meanwhile, breaks out of its tie with Norway and Iceland for a fourth-place finish. Improving in one area can help a country improve its performance in all four areas. For example, corruption can take a toll on a people’s well-being, stifle economic growth and spark a desperate struggle for mere survival that can rob a country of its peace. Likewise, improvements in education — a “human development” issue — can reduce tolerance for corruption, open up additional economic opportunities and calm the overall social environment. Some countries, including Canada, have done a good job in that regard, and have the excellent quality of life to show for it. But for now, the Danes can justifiably pat themselves on the back for a job well done — and grin broadly at how jealous the Swedes, their traditional friendly rivals, will be. Statistics Canada has long been in the habit of releasing annual interprovincial net migration numbers, which never fails to stir up a bit of debate here in Manitoba because we — like several smaller provinces — almost annually see more people move out to other provinces than move in from them. If we’ve long known where provinces stand in relation to one another, the same hasn’t been true for cities. 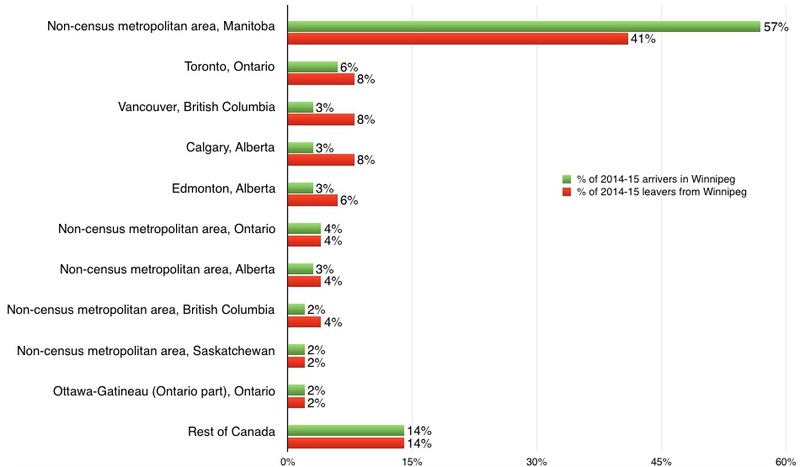 Only recently did Statistics Canada release its first data on movement between the nation’s cities — this coming to my attention only after reading the Worthwhile Canadian Initiative blog’s analysis of the patterns. What does Statistics Canada’s numbers say about Winnipeg? To no one’s surprise, the majority of Winnipeg’s domestic newcomers in 2014-15 — 57 percent — came from other parts of Manitoba. Meanwhile, 41 percent of those who left Winnipeg, but not the country, also stayed within Manitoba. English-speaking Canada’s five big metropolitan areas — specifically, Toronto, Vancouver, Calgary, Edmonton and Ottawa — were the next largest sources of both domestic newcomers and leavers, collectively accounting for 17 percent of those who moved to Winnipeg and one-third (32%) of those who moved away from the city. Rural and smaller cities and towns in the western provinces and Ontario collectively accounted for little more than one-in-ten newcomers and leavers. The flow to and from more distant parts of Canada was distinctly thinner. Fewer than two percent of those who moved out in 2014-15 ended up in either Quebec or Nova Scotia, while the other East Coast provinces and the northern territories only drew tiny numbers of Winnipeggers. Indeed, across Canada there was a distinct pattern whereby those who left their communities either stayed within their provinces, or moved to Alberta or B.C., or to a lesser extent moved to the closest convenient province, eschewing more distant ones. For instance, of those who left Thunder Bay, Ont. in 2014-15 — a city facing a bleak future — 69 percent remained within Ontario, while the only other provinces to capture five percent or more of leavers were Manitoba (5%), B.C. (9%) and Alberta (11%). A similar pattern could be seen in Halifax, where there was a strong preference for Ontario (27%, identical to the percentage of Halifax-leavers who moved to other parts of N.S. ), with only Alberta (18%), B.C. (7%) and New Brunswick (7%) cracking the five-percent mark. (Newfoundland and Labrador, however, came close at 4.7 percent). The same pattern of staying as close to home as possible unless a truly compelling economic, educational or retirement opportunity beckons shows on the arrivals side. Of domestic migrants who arrived in Winnipeg in 2014-15, for example, 57 percent were moving within the province as noted above, while nearly one-half of those who arrived from another province came from either Ontario (38% of those arriving from outside of Manitoba) or Saskatchewan (11%). Almost all of the remainder came from within western Canada: 22 percent from Alberta and 16 percent from B.C. The strong pull of the Big Five cities, compared to the inconsequential effect of the country’s secondary cities, illustrates the former’s importance in Canada’s future. But ultimately the most important markets for each of Canada’s cities, in terms of the ebb and flow of citizens, are their own hinterlands. Does politics give people the blues? During the 2012 U.S. presidential election campaign, one YouTube video that went viral showed four year old Abigael Evans crying as she tells her mother, “I’m tired of Bronco Bamma and Mitt Romney”. The video was still getting views in 2015, when a commenter left a message on the site telling Abigael not to feel bad, as politics could make grown-ups cry as well. Both she and the commenter were far from alone. A mid-May Economist article noted that young people are so turned off by politics that to even discuss such topics in a social setting is “deemed distasteful” and that it “kills the mood”. People appear to dislike politics and politicians so much that prompting them to think about them has a very large downward effect on their assessment of their own lives . . . [T]he effect of asking the political questions on well-being is only a little less than the effect of someone becoming unemployed, so that to get the same effect on average well-being, three-quarters of the population would have to lose their jobs. Three months later, another change was made to insert a buffer between the political and life-satisfaction questions for all respondents. 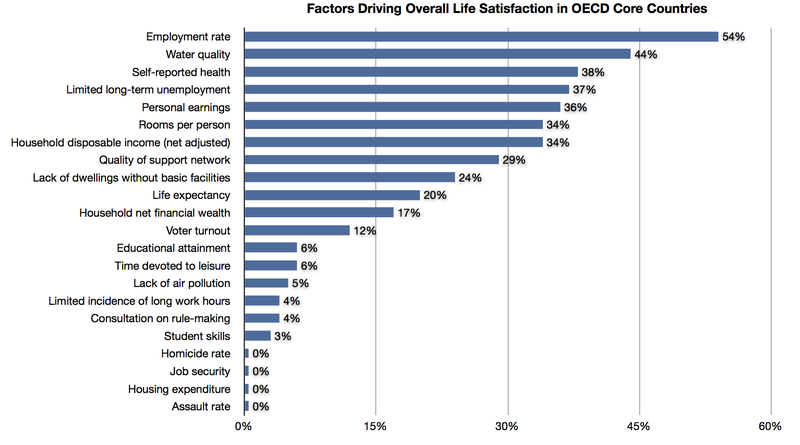 Immediately, this showed up as an increase in how well people rated their overall life satisfaction compared to the answers they gave when there was no buffer. As Deaton observed, the jump in reported life satisfaction was equivalent to the expected effects of “a more than doubling of per capita GDP”. While this says something about the risk that one set of questions in a survey could accidentally influence how people respond to the questions that follow, it also says something about why Canadians and others around the world are tuning out on politics: if having politics on their mind makes them feel worse about life, and not thinking about it makes them feel better, the sensible thing to do is to give politics no more attention that necessary. Politicians who wish to make the societies they govern happier places to live, and to keep the dreaded it’s-time-for-a-change sentiment at bay until a later election, might find that their best bet is to simply stay out of their constituents’ faces. And as for the large numbers of politically disengaged people, about which there has been much hand-wringing in recent years, the best policy might be to simply leave them in peace. * – Available at the Millennium Library in Winnipeg at 306 WEI 2015. A Statistics Canada study released Monday on how Canadians assess their satisfaction with life in general produced what appeared to be, on the surface, a middling finding for Winnipeg, whose citizens rated their life satisfaction 7.9 out of 10 on average, slightly below the national average. The highest scores were in Saguenay, Trois-Rivières and St. John’s (average rating: 8.2 out of 10), and the lowest scores were in Toronto, Windsor and Vancouver (7.8 out of 10). Yet in the bigger picture, Winnipeg was only in the lower-middle of a very narrow spread, in which the average score given in the highest and lowest ranked cities only differed by four-tenths of a point. In terms of the percentage of residents who rated their life satisfaction as an “8 out of 10” or better, Winnipeg’s 67 percent was at the lower end of a similarly narrow 66-to-73 percent range that 26 of the 33 metro areas were part of. They were not unemployed: Statistics Canada’s analysts found this had a “strongly negative” effect on life satisfaction. They could enjoy the company of others: Single, separated, divorced or widowed people expressed lower average life satisfaction. Those who knew their neighbours and felt a sense of connection to their community tended to be more satisfied with their lives. They were making a sufficient income: The biggest gap in life satisfaction was between households with incomes of less than $30,000 annually and those in the $30,000 to $59,999 range. While average life satisfaction tended to increase as one got into the higher income levels, the gaps between income categories were not as large. Thus, there is something to the old saying that “the best social program is a job”, which some Winnipeggers have difficulty obtaining because of low education or literacy, difficulties with arranging child care or transportation, or because of the bureaucratic nightmare associated with getting foreign degrees, diplomas and work experience recognized in Canada. But for those who are working yet looking for a little more happiness nevertheless, the best solution might be a gym membership — preferably at a facility with a shared social area, such as a hot tub or sauna — which offers the ability to get fit and to meet others at the same time. As leader of one of the world’s best-managed countries, Danish prime minister Helle Thorning-Schmidt (left) had something to smile about. In most large bookstores, you will find a wide selection of ghost-written books in which celebrity CEOs explain the secret of their success, or how they turned a perennial also-ran into an industry-leading corporation. Alas, it is more difficult to find helpful advice on how to accomplish the same when running a country, even though some good advice widely shared among the world’s politicians would surely improve the lives of billions. But today’s release of the 2014 Corruption Perceptions Index — the final of four sets of annual rankings I’ve been awaiting — brings us a little bit closer to figuring out which world leaders should be asked to write such a book on how their countries came to be the world’s best-managed, and thus the best places to live. Based on their overall rankings in the UN’s Human Development Index, Transparency International’s Corruption Perceptions Index, the World Economic Forum’s Global Competitiveness Report and Vision of Humanity’s Global Peace Index, Denmark is arguably this year’s best-managed country, with Switzerland and New Zealand close behind. Finland and Norway round out the Top 5, while Canada finishes in seventh place. Singapore makes a surprise 8th-place showing here, boosted by a strong showing in three of the four indices, the exception being the Global Peace Index. Since different indexes use different “highest” and “lowest” scores — e.g., the best possible score in the HDI would be ‘100 out of 100’, but ‘7 out of 7′ in the Global Competitiveness Report — I’ve standardized the scores by showing the best performer’s raw score in each category as a “100”, and then calculated the other countries’ proximity to that front-runner. While there is significant overlap between the indices, the objective of this exercise is to get a rough sense of which countries have got the balance right in securing a good life for all of their citizens — a life under human rights and the rule of law, enjoying a sense of security without feeling oppressed, and able to benefit from good economic opportunities. What makes the front-runner countries work? Some hints might be found in this January 2014 chart (and the accompanying post) which showed that employment prospects, quality infrastructure and housing, personal health, personal cash-flow and a solid social support network all contribute significantly to a better quality of life. Additional insights might be gained from this timely Dec. 1 post on the World Economic Forum’s blog, which noted that countries with trustworthy, reliable governments and in which citizens feel less “alone” to face life’s challenges tend to make for better places to live. Indeed, those with a passion for making their city, province, state or country a better place to live will find many good ideas — originating from both the left and the right, and often from neither — on the rest of the World Economic Forum’s blog site. In Canada’s case, it appears that the one factor we need to work on the most to get toward “number one” is on cleaning up corruption perceptions. Though Canada was (just barely) one of the world’s 10 least-corrupt nations in this year’s Corruption Perceptions Index, we lagged behind front-runners Denmark, New Zealand and Finland.